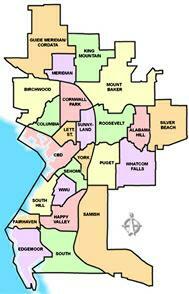 Wondering what's going on in the real estate sector of Bellingham's Columbia neighborhood? Here's a look at an overview of current properties on the market, pending homes that are on their way to the closing table, and properties that have sold from November to present (the last 6 months). This will give you a clear picture of present activity, as well as, what has happened over the course of the winter in the Columbia neighborhood real estate market. Of these properties there are only 2 short sales pending, 1 bank Owned Home, and no estate sales. Of these homes for sale there are none that are 0 bank owned home, 0 short sales, & 1 estate sales.